Sociologist Jack Fong talks to us about the death café movement, in which strangers come together over coffee to come to terms with their own mortality. “At a Death Café people drink tea, eat cake and discuss death.” That’s how the homepage for Death Café, an international social phenomenon centered around mortality, describes itself. Since its first incarnation, held in London in 2011, there have been more than 5,000 Death Cafés in over 40 countries. Participants, usually around a dozen, almost always strangers, gather together in a home, restaurant or Café to talk civilly about that most discomforting of subjects. Meetings, which are explicitly not portrayed as therapy sessions, have no set agenda; each gives only their first name; frank open discussion is the sole aim. Discussions are surprisingly cheerful. 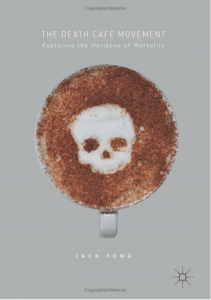 Sociologist Jack Fong has written the first book about the death Café movement. For Jack Fong, an associate professor at California State Polytechnic University who learned about Death Cafés in 2012 from a newspaper article, the phenomenon was irresistible. “As a sociologist I wanted to be the first to call it out as a movement,” he says. Fong, whose previous topics of study included solitude and religious nationalism, was blown away. “Here were these folks cutting through the BS of life, getting through all the clutter to focus on what binds us all together: our mortality,” he says. In August Fong published The Death Café Movement: Exploring the Horizons of Mortality, the first such work on the topic. In researching the book he attended seven three-hour-long Death Cafés. During discussions Fong focused on spotting recurring themes and observing how participants interacted with one another. Much of the book is a critique of modernity’s relationship with death. Fong fumes at what he deems the “trinity of the market, media, and medicine,” the key outlets through which polite societies acknowledge death. Such institutions, Fong writes, serve more to terrify and keep us in the dark than nurture acceptance, understanding or comfort. We reached out to Fong to hear more about the movement and the “ultimate challenge” of accepting one’s own mortality. 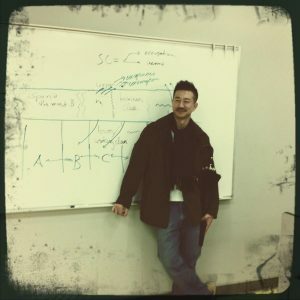 How did this project start for you? At a certain point in my life I noticed that I was attending more funerals than weddings. That really had a profound effect on me. But I just let it simmer in the background until late 2012, when I read that Los Angeles Times article [on Death Cafés]. At the time I was going through a lot of inventory-taking about my life; my father was very ill. I just felt like I probably should go check out this place. Immediately I was blown away. You’re in a room with strangers and it’s amazing what people will say when their identities aren’t disclosed. It’s so real, raw and pure. In your attendance as a researcher were you speaking up or just observing? I did speak up. As a sociologist I tend to see things on a larger scope and one of the things that bugged me a lot about death and dying is these large systems in our society that monopolize it. I shared those sentiments there: that I believe that when these systems take over our language about death people become fearful because they are no longer authors of their own mortality. I expressed my frustration with modern medicine. I lost my brother-in-law a year or two before I began my research. I saw him die. The last few weeks of his life all the decisions that were made were made by his oncology team. My sister had to listen to these doctors. They look at the human body as a machine that can be dialed in and out. I was annoyed at how the medical system saw itself as the sole bearer of one’s mortality. In other words, if someone is experiencing a terminal illness the default assumption is that you go to the hospital to get treatment and if it doesn’t work you potentially die there or you die in another organ of the hospital infrastructure, like a hospice center. The point is, if you look at most of how Americans died in the past, or how most humans died around the world, we usually died at home with family. And we usually were surrounded by people who were there to comfort us, not at the level of providing medication but soothing us emotionally or attending to us spiritually. All of that is missing in the hospital, which turns death and dying into a series of regulatory practices. My whole point is: if you are going to die you should be the author of your own mortality. If you believe there’s such a thing as a good death that cannot possibly be found in a hospital setting, then you should go somewhere else. Go home. Go to a place where you can find peace. From a sociological perspective what attracted you about Death Cafés? I’m very concerned as a sociologist about just how much opulent western society denies death. If you go to a Death Café anywhere in the U.S. I guarantee you someone will bring this up. The way we are in denial about it, the way we practice living as if we could live forever, has made us rather unprepared for that moment when we check out. We tend to use our money to buy into contraptions that remind us that we can live forever. The classic evocative image is all the lotions pitched to women to look young, the cosmetic practices to not have wrinkles. It’s really an embodiment of that sentiment. The way we practice living as if we could live forever, has made us rather unprepared for that moment when we check out. This is why the medical health care system has so much power, because by the time we are ill we aren’t going there rationally: we’re going out of fright. The hospital should not be an environment that allows this type of sentiment to proliferate, but the reason it does is because the hospital has no capacity to speak about death that’s not mechanical. What draws people to their first Death Café? People generally fell into three groups. The first group was those trying to minimize their fears. Interestingly, the fear that most people have about death is not a fear of pain. Modern medicine has all we need to kill our pain. Most people are afraid of the aloneness of that moment. The other group were those who had lost a loved one. I met a mother whose child, when 30, died from an allergic reaction to a pharmaceutical drug. Those kind of people are looking for closure, and some sense of meaning in what is essentially quite meaningless if you’re not religious; it’s religion and culture that tries to make sense of death. A third group I met were those who had tried psychotropics. They’re cheerleaders for these types of drugs, like ayahuasca, as am I. Some of these folks look at death as an altered state of consciousness where you actually don’t die. That’s what the movement is about: people determining their own destiny outside of what the doctor or media tells them. I started to go to Death Cafés in 2013. I would go to one and spend an entire month thinking about it. The stuff people say is so profound. I met shamans; people who took psychotropics; people with near-death-experiences; moms who lost their kids to suicide; suicide survivors; I met funeral home directors. It’s just amazing how people from all walks of life want to find out if they can be the authors of their own death. That’s what the movement is about: people determining their own destiny outside of what the doctor or media tells them. They’re trying to find their own formula. Because if you don’t the system will do it for you. What were you most surprised by in your research? The cover to The Death Café Movement. It’s astounding how many people want to be part of this, to hear what Joe Schmo or Jane Doe is saying about death. The Death Cafés have waiting lists! They don’t care if someone’s working at McDonald’s or Walmart: these people know that death is a great equal opportunity employer. It’s just so amazing how death brings people together. How has this affected your own approach in facing death? The challenge now is to accept my death. That’s the ultimate challenge. I don’t think I can just yet. I love living and I love my life. Death is so inconclusive, filled with questions more so than answers. What I fear is how lost we are as a tribe. We’re a lost species. A lion wakes up and knows exactly what it’s got to do. But we are so lost. I’m a little bit afraid of that because I don’t want to be lost when I’m dying. It’s just so amazing how death brings people together. Would you recommend that everyone attend a Death Café? I think every agnostic or atheistic American should go to a Death Café at least once. Most people think of death talk as purely taboo. 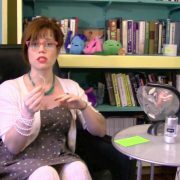 To me that’s unfortunate because when I hear people get disgusted by a discussion of death I look at this person as someone who’s going to die screaming out of fear. They are going to be petrified. I’m not going to be part of that group. I’m going to do so with dignity and make sure that I author my own last moments, if I can.